Language Development 9 Edition Note: This is the bound book only and does not include access to the Enhanced Pearson eText. To order the Enhanced Pearson eText packaged with a bound book, use ISBN 0134092740. This best-selling introduction to language development text offers a cohesive, easy-to-understand overview of all aspects of the subject, from syntax, morphology, and semantics, to phonology and pragmatics. Each idea and concept is explained in a way that is clear to even beginners in the field, and then reinforced with outstanding pedagogical aids such as discussion questions, chapter objectives, reflections, and main point boxed features. The book looks at how children learn to communicate in general and in English specifically, while emphasizing individual patterns of communication development. 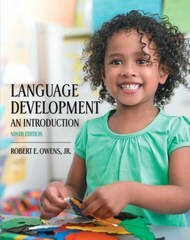 The new Ninth Edition of Language Development by Robert Owens continues the distribution of bilingual and dialectal development throughout the text; expands the discussion of children from lower-SES families, including those living in homeless shelters; makes substantial improvements in the organization and clarity of Chapter 4 on cognition and its relationship to speech and language; consolidates information on Theory of Mind in one chapter; improves readability throughout with more thorough explanations, simplification of terms, and increased use of headings and bullets; weeds out redundancies and asides to help streamline the reading; provides more child language examples throughout; and thoroughly updates the research, including the addition of several hundred new references. The Enhanced Pearson eText features embedded video. Improve mastery and retention with the Enhanced Pearson eText* The Enhanced Pearson eText provides a rich, interactive learning environment designed to improve student mastery of content. The Enhanced Pearson eText is: Engaging. The new interactive, multimedia learning features were developed by the authors and other subject-matter experts to deepen and enrich the learning experience. Convenient. Enjoy instant online access from your computer or download the Pearson eText App to read on or offline on your iPad® and Android® tablet. * Affordable. The Enhanced Pearson eText may be purchased stand-alone or with a loose-leaf version of the text for 40-65% less than a print bound book. * The Enhanced eText features are only available in the Pearson eText format. They are not available in third-party eTexts or downloads. *The Pearson eText App is available on Google Play and in the App Store. It requires Android OS 3.1-4, a 7” or 10” tablet, or iPad iOS 5.0 or later.